Mix all ingredients well and chill, preferably overnight. 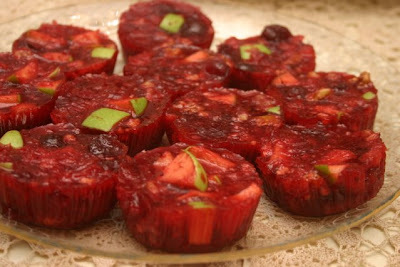 And at the last minute, I decided that instead of making a traditional cranberry sauce for our Thanksgiving meal, I'd try the recipe I found in a magazine for Cranberry-Pineapple Minis, a Jell-O fruit salady thing that I really, really liked! 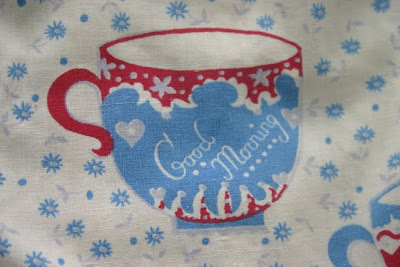 Made in cupcake liners, these would be a perfect item for a tea plate, perhaps even in mini-cupcake size. Interested? You can find the recipe here. Hope you have a blessed Thanksgiving! 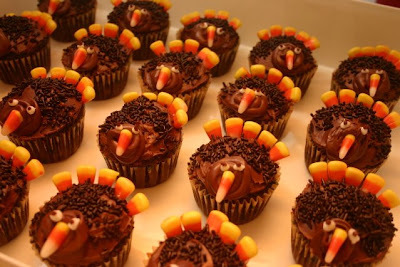 And I hope that along with your turkey (or turkey cupcake), you have lots of tea on your table! In the what-will-they-think-of-next department, a California company has concocted a carbonated tea beverage. 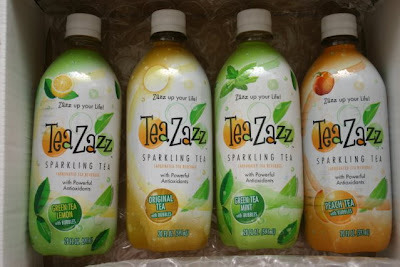 Yesterday I received a box with samples of four different flavors of this TeaZazz Sparkling Tea. I've tried only one so far, the Peach Tea, and although I'm more of a traditional hot tea kinda girl and wouldn't want this to be my "everyday tea," I have to say I thought it was a tasty and gutsy twist on the ever-growing RTD (ready to drink) market. Happily, this tea had just 20 calories per serving and contains sugar syrup rather than high fructose corn syrup. It was quite filling, so I didn't drink it all in one sitting, either. The company calls this "a healthier alternative to soda" as well as a new way for tea drinkers to enjoy their tea. I'm quite open to that. When I'm shopping or out running errands, I don't always have a tea mug with me, and I occasionally opt to get bottled tea at a convenience store or perhaps a Starbucks. Recently I was at a Starbucks and grabbed a bottle of Tazo Tea's Iced Tea with Lemon. Now I can't say I've ever actually sipped Lemon-Fresh Pine-Sol after it's been used to mop the kitchen floor, but if I had, Tazo's Iced Tea with Lemon is what I imagine it would taste like. We won't be making *that* mistake again! I would, however, be happy to drink this TeaZazz bottled tea again, and the $1.69 retail price for a 20-ounce bottle is quite good for the category. So what about you? Would you ever try a carbonated tea beverage? And if you're on the west coast and have already tried this new tea, what did you think of it? That's probably all I need to say, right? You know, I really *do* try to develop sales resistance during the holidays, but man, it is hard when they come out with so much cute stuff. Already I have bypassed a pen I loved, an antique tea set that was a steal, and of course more than a few pieces of holiday china I don't need and don't have room for but would love to have. But this tea mug? I was looking for some particular gifts, had zipped down an aisle and was quickly rounding a corner, and then my subconscious kicked in. "Tea? Did that mug say tea? No, surely not. It must've said Christmas TREE. Right?" Well, you see what it says and you surely understand why I had to have it. Now I have a rule that I don't use Christmas china 'til the day after Thanksgiving at the earliest, and I started to wait 'til Friday to share this. But Hallmark had only a few of these on the shelf and I have a feeling some of you may want one. And unless you're shopping for others, I suggest you try not to look around too much because they have lots to like this year. On Saturday I had the privilege of being the guest at not one but two special events with some dear friends. 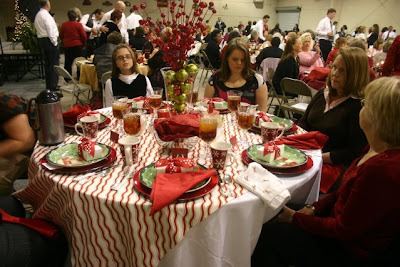 In the afternoon, I attended a Birthday Tea given in honor of my friend Krista, who will turn 40 on Thanksgiving Day. 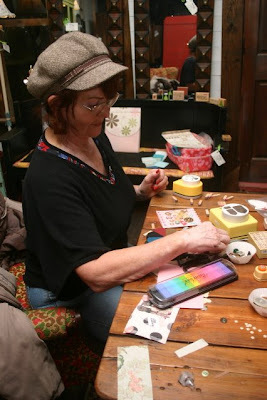 We all met at Spoons in downtown Newnan, which isn't a traditional tearoom but does host teas for groups by appointment. 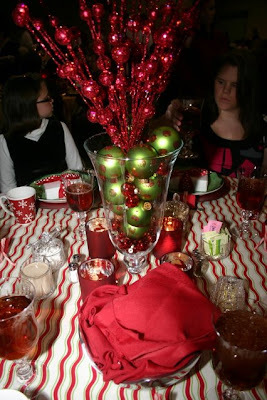 The tea fare was delicious and nicely presented, but the company was what made this tea so fun. I got to visit with some old friends I haven't seen in a while (Hi Tammy! Hi Misty! ), and I so enjoyed how we all went around the room telling how we got to know Krista and what a blessing she and her family have been in our lives. One woman there said it was so special because you normally have to be at a funeral to hear these sorts of things. I'm so glad I was able to be part of such a wonderful afternoon honoring such a lovely friend. And typical of Krista, she gave all of *us* a gift to thank us for attending her tea. 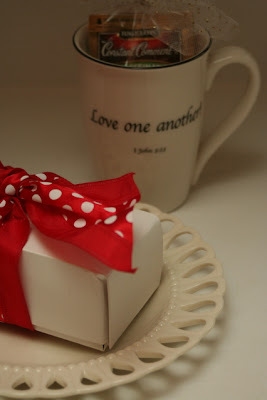 It was this great tea mug bearing the words "Love One Another! 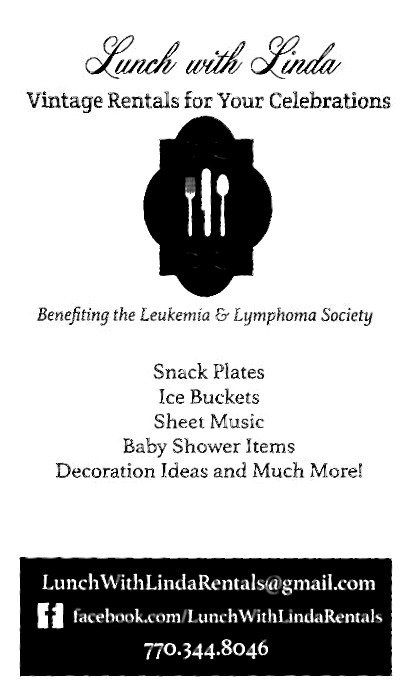 I John 3:23" which she tells us is a line of tableware now carried by You're Invited, the stationery shop in downtown Senoia. It's located right next door to my friend's shop, so I'll be visiting there soon. The treat from Ashly this year was an elegant box of homemade chocolates, both of which she said are "candy bar" recipes courtesy of Paula Deen. I assumed this meant they both had a ton of butter in them? Yes, she confirmed, and yummy isn't *even* the word for these things. 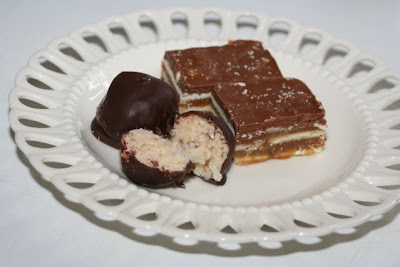 The bars are homemade Kit Kat bars, and the balls taste just like Mounds candy bars! (I accidentally turned my box of treats upside down in transit, so please know that the bars did not have crumbs on them when Ashly presented them. She makes delicious baked goods that are also known for being the most absolutely perfect looking treats you've ever had.) Ashly said one of the recipes came from the Food Network website and another came from Paula Deen Magazine. I can only tell you that there are few things in life more agreeable than sipping hot tea from a new tea mug and noshing on chocolates from a friend. Life is indeed sweet! Save that new Harney catalog! Harney does a lot of things right, and I don't mean just producing excellent tea (although that is clearly the most important thing they do right). But they also are a consumer-friendly company, and I love when I get an e-mail letting me know the new catalog is in the mail. Someone in marketing is on her (or his?) toes, and sure enough, that catalog lands in my snail mail box shortly after the announcement in the e-mail box. Nice! And aside from the usual lovely catalog, which the U.S. Postal Service was kind enough to deliver in mint condition, this one has a feature many of us will appreciate. 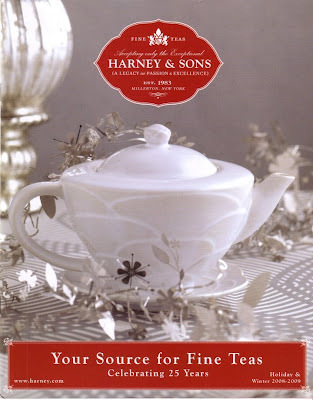 You know that new Michael Harney book, "The Harney & Sons Guide to Tea," which several of us tea bloggers have written about lately? Well, as I mentioned I want to go through the book next year and sample one tea per week. 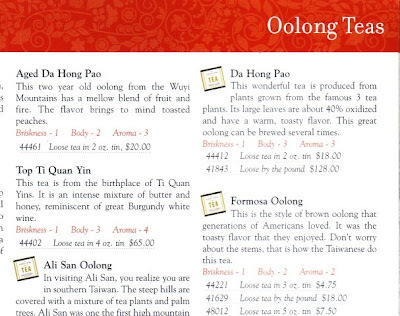 This particular catalog will make selecting these teas quite easy. 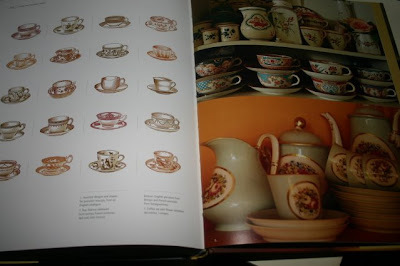 A tiny little graphic from the book's cover appears next to the catalog's teas which are featured in the book. Now wasn't that smart of them? This will be quite helpful to those of us who wish to know which "book teas" are available for purchase. The catalog notes, "While not all 56 teas are available currently in our catalog, due to variables in tea gardens, growing seasons, and availability, we've tried to offer as many as possible." So, if you've got the book, you will want to make sure you keep this catalog handy! 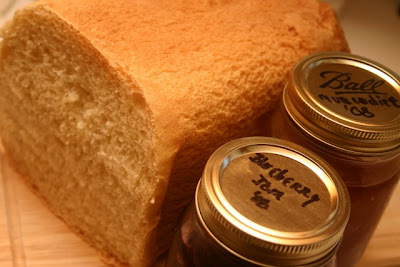 So, here's the bread and here's the jam. Tell me, is there any better fragrance than fresh bread baking in your kitchen? 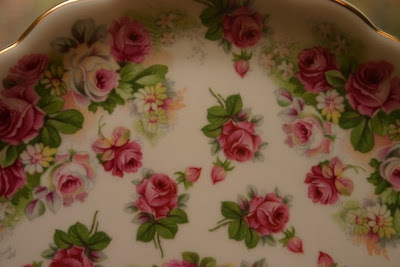 I do love pink roses, and I think one reason I so enjoy collecting and using teawares is that so many of them bear the image of my favorite flower. My favorite roses are those full blown cabbage roses, just like the ones depicted on this set. So Spring may be far away, but with a few rosy teawares it's possible to enjoy roses all year long -- and enjoy a tasty treat as well! 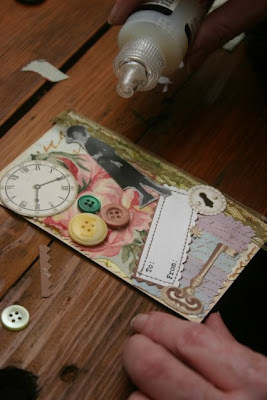 Yesterday I was blog surfing when I came across a delightful blog called Button Floozies, and I learned they have decided to host International Button Week. So of course as an amateur button lover I had to find an appropriate way to celebrate, and this is what I came up with. It took about 30 minutes to make last night, but don't look too closely or you will see the gobs of hot glue hiding in between all those buttons. One day, when I am in a more leisurely mood, maybe I'll try actually *sewing* the buttons in a teapot shape on a pillow, as I think that could be really pretty. This is actually an idea I've had for a while, but when I learned of the international observance it prompted me to action. 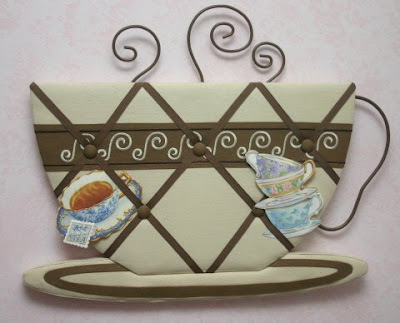 I have a couple of teapot templates I saved from some craft kit years ago. I traced the one I like best on a sheet of construction paper and began filling it with some white buttons. (Mother of pearl ones would be prettier, but I glued all those to the little metal trash bin in my craft room last year, alas.) When that practice piece was done, I used a white quilting pencil to outline the teapot template on a piece of blue-green velvet and commenced to hot gluing buttons. Are you a button lover? 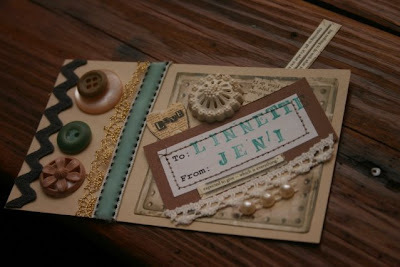 I am, and I can't think of too many crafts a nice button or two wouldn't improve upon. And I'd like to use them in some new and different ways. In fact, I've been thinking that if I can find some nice large buttons with rims around the edges, it might be fun to compose collages within the "frame" of the button. If I come up with something else tea-ish in button land, you know I'll share it here! 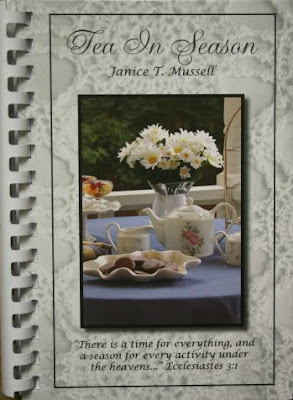 Recently there arrived in my mailbox the most lovely new tea cookbook, "Tea in Season" by Janice T. Mussell. The author is a teacher in Stockbridge, a town I haven't traveled to in years but certainly need to since there is a tea room there I've never visited! 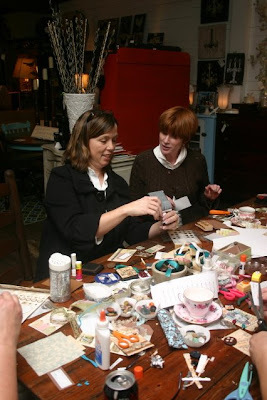 According to an article in the Henry Herald, it was after a visit to the Pinehurst Tea Room with her daughter Mindy that Janice got the idea for her book. The title was inspired by Ecclesiastes 3:1, which says there is "a season for every activity under the heavens." I love that! And what a great book this is! 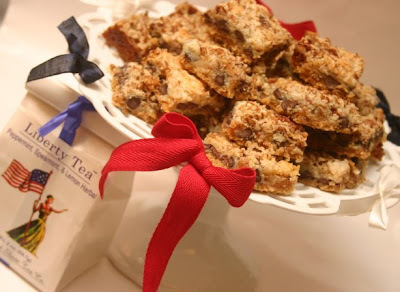 The book is divided into five sections: Festive Teas, Holiday Teas, A Medley of Teas, Ministry Teas and Motivational Teas, with each section offering menus and recipes for four teas. In addition to some of the traditional holiday teas (Valentine's, Easter Brunch, Thanksgiving, Christmas, Bridesmaids' Tea), some of the other teas included are a Neighborhood Tea, which can be adapted for "at home" or "at work"; a Jesus and Me Tea, which encourages taking time alone with God and enjoying tea (awesome idea); and a Rainy Day Tea for the children. Janice includes recipes from her family and friends, and there are so many of them I can't wait to try. There are "Thursday Raspberry Bars" (someone brought them to work every Thursday), Chocolate Syrup Brownies, Christmas Divinity, Tropical Coconut-Pineapple Tarts, Heart-shaped Cheese Mold, Sausage Swirls, French Toast Casserole ... well, actually I haven't seen anything I would *not* like to make! 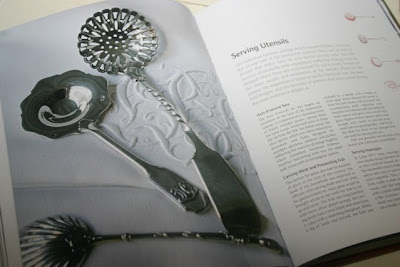 At 194 pages, this hardback book is much thicker than the usual self-published cookbook. And I have to tell you, I have seen a lot of self-published books over the years that were so dreadful, the kindest thing I could do was never mention them. 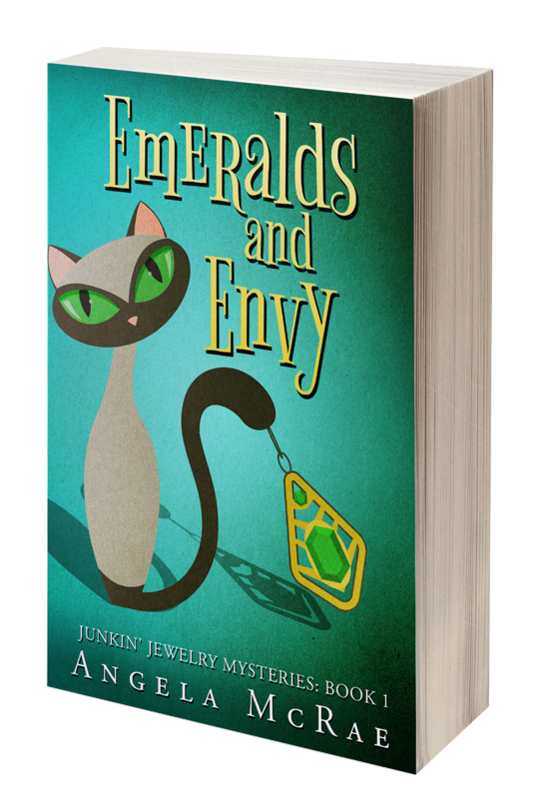 This one is a real gem, a beautifully photographed and written book, and I am delighted to have "met" Janice Mussell through my blog. Interested in getting a copy of her book yourself? 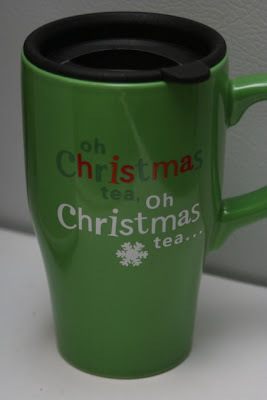 Visit www.teainseason.com or e-mail her at janice@teainseason.com. 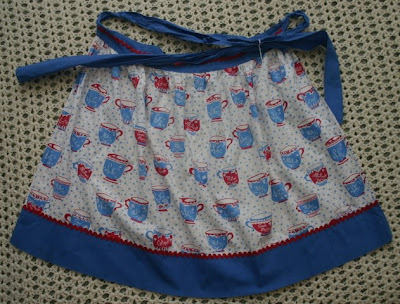 Years ago, I started collecting aprons and probably had about 40 or 50 of them. But aprons take up a lot of room, I didn't have a way of displaying them, I wasn't really wearing many of them (occasionally the Christmas ones), and so I eventually sold them on eBay. I now keep just a few for my nieces to play dress-up in, but this one was too cute to pass up. I had the best time last night! It had its start one afternoon last summer when I went to visit my friend Liz at her shop in Senoia, Cydney's Alley, and we worked on making collage-style Christmas tags. 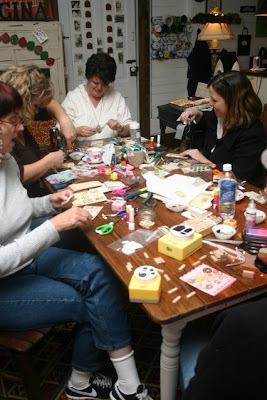 Several of the customers asked about them as we worked behind the counter that day, so Liz decided to see if there was interest in others joining us for a little tag-making session one night. We settled on Nov. 13, and five women signed up. I already knew Sharon who, like Liz, is a longtime friend I met at church, and I had also met Liz's fellow shop owner Ann, who owns Beyond the Door, another great gift shop in Senoia. 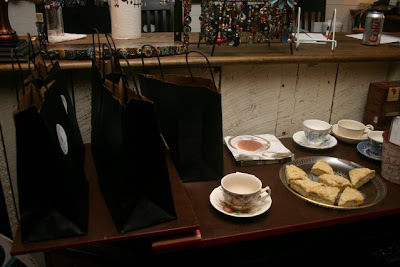 The other ladies were Marita, Mary and Jeni, and I liked them immediately when several of them complimented my scones! I like to turn any gathering into an impromptu tea party if at all possible. Now as I told them, I am really not a teacher and not a professional crafter, but I do like to play around with paper crafts. So basically, we just shared a bunch of supplies, laid out the sample tags Liz and I had made, and the ladies had at it. I was happy to see Marita enjoying the teatime punch I blogged about recently. In addition to getting to share some tea and scones and make new friends, I also got some new ideas for tags of my own from these ladies. 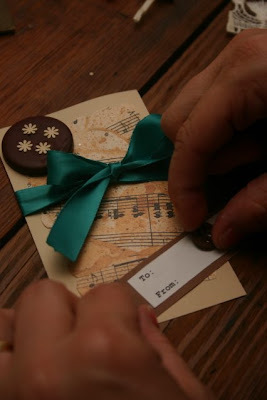 I'll end with a few of their mini-masterpieces in case you'd like to pull out those unused scrapbooking supplies and make a few of your own. 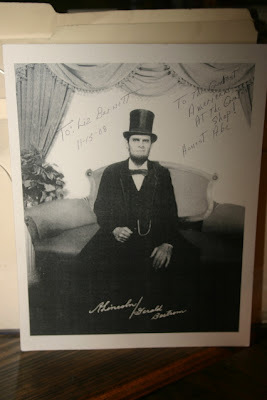 who is in town from Michigan, giving talks and selling photos of himself in character as, yes, Abe Lincoln! 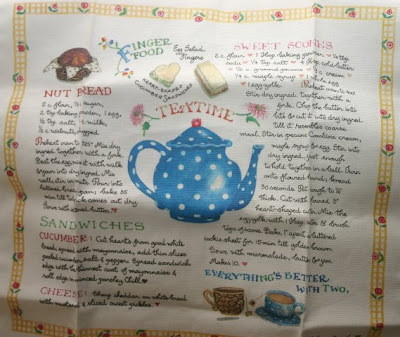 Over the summer I found this cute Susan Branch tea towel at an antique mall. Are you familiar with her work? 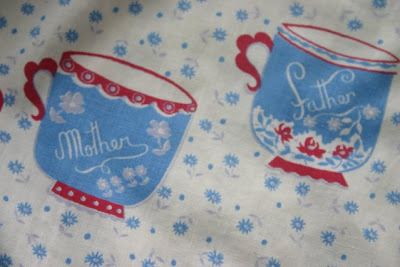 She has designed everything from rubber stamps and stickers to a great new line of fabric with teapot and teacup motifs, but the tea towel was an inexpensive way to start my Susan Branch collection. 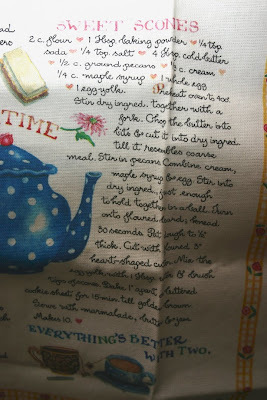 Recently, I paused to actually read the recipe for "Sweet Scones" and was surprised to see that the sweetener is actually maple syrup! Since I love the combination of maple and pecans, this sounded like the perfect -- and easy -- fall scone recipe. So, I whipped up the recipe, substituting buttermilk for the cream, since I rarely have cream on hand unless I'm planning to do a lot of baking. 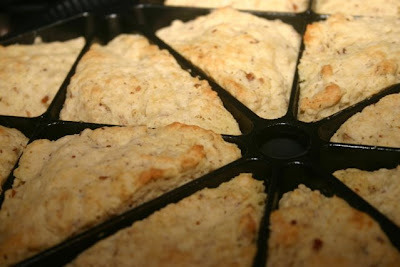 I didn't brush them with egg (I don't really like for my scones to "shine"), and I find cut-out scones too much trouble, but the recipe was a perfect fit for my 16-scone mini-scone pan from Williams-Sonoma. These took about 10 minutes to mix, 15 minutes to bake, and voila, perfect scones. I made these as treats to take to an event tonight, and of course had to sample. Yummy, and easy! Congratulations to Gerri, Frivolitea and Teresa, our tea sample winners. Gerri, I believe yours is the only address I'm missing, so if you'll send it to angela@newnan.com I'll get those packages out ASAP. Thanks! It's funny, but when I see those sweepstakes where you can win, say, a $50,000 kitchen makeover, I think nah, I just want someone to come in and organize my craft room. 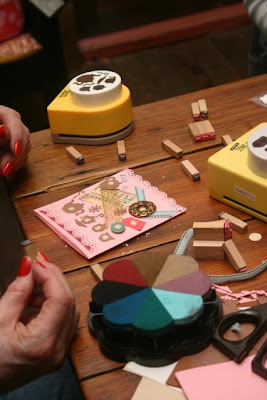 Attack those boxes of tangled ribbon, sort and label old buttons, catalog all my patterns and magazines ... ahh, that would be heavenly! But meanwhile, I've decided getting the tack board off the floor and onto the wall would be a good start. So far, the new tack board looks so nice and tidy, all I've added are a couple of cute notecards from friends. 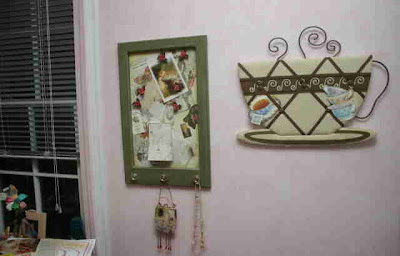 If you have one of these type tack boards in your craft room, what do you have on it? Inquiring minds want to know! 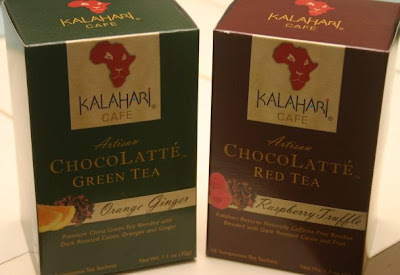 Want to try some Kalahari teas? I've already been sharing the teas with friends in and out of the office, but I still have plenty left to share. So, hmmm, I wonder who else might enjoy trying some of these teas? If you would like some free samples, just leave a comment to this post anytime before 7 a.m. tomorrow for a chance to have a nice sampler headed your way. I'll be selecting three names, so that should definitely increase your chances of winning! OK, the election's over, my sweet new nephew has arrived, so now we return to our regularly scheduled program: tea, teawares, and the like. And I am so thrilled with a great new review copy of a book I received last week, I couldn't wait to share it. Originally published in France in 2005, this is the English version of Ines Heugel's "Laying the Elegant Table: China, Faience, Porcelain, Majolica, Glassware, Flatware, Tureens, Platters, Trays, Centerpieces, Tea Sets." If you're like me, the title alone is enough to make you want to check it out. Naturally I turned to the chapter on Tea, Coffee and Chocolate right off the bat, and I was happy to find not only some new information but also some lovely photography and line drawings. There are definitely some things I've never seen before, such as the drawings of six different strainer baskets that fit over the end of a teapot. And how have I missed hearing about the tisaniere? I was able to guess at its meaning since I know what a "tisane" is, and indeed a tisaniere is the name of a French set for serving herbal tea. See these three sugar spoons? I saw one like the third one at an antique mall in Florida over the summer and at first thought it was a tea strainer. Apparently this falls into the category known as "confection servers." 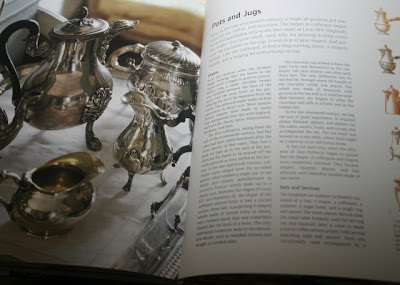 I also enjoyed reading about the history of dining, dining rooms, eating utensils and tablewares. And I learned that one reason there is so much blue and white dinnerware is that blue was considered such a reliable pigment, it was always tested first against a white background. So these are the sorts of things you'll learn about in "Laying the Elegant Table," a beautifully photographed book which immediately rose to the top of my "teawares" library. M is for ... Matthew! For some while now, I've heard what I assumed was the urban legend of Italian restaurants whose Eggplant Parmigiana is said to prompt expectant moms to go into labor. 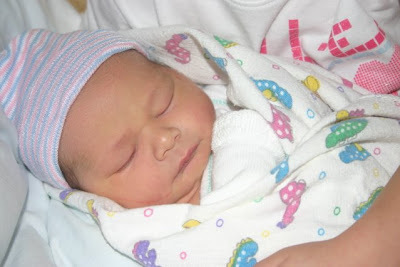 All I know is, my sister Rhonda went to some Italian restaurant in Douglasville on Friday night and got the Eggplant Parmigiana, and at 8:03 the next morning she delivered baby Matthew, the latest delightful addition to our family! 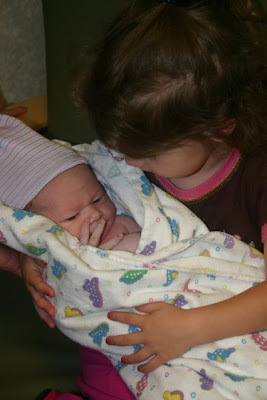 So he was born on the 8th at 8:03 a.m. and weighed exactly 8 pounds. And all in the same year as the 8-8-08 Olympics, which I think is kinda cool. Since some of you have been kind enough to ask about my new nephew, I thought I'd post a few photos from yesterday and today. My sister didn't want me to post any of her until she could fix her hair, and since I would no doubt feel the same way in her shoes, I am just posting photos of the kiddos. 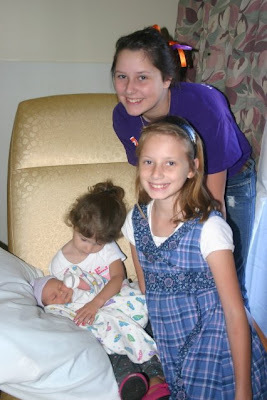 Here he is with Madison, 12, and Cari, 9, who is glad that she is no longer "the middle child" but instead "next to oldest." We tend to fight over holding babies in my family, but I did not expect 3-year-old Amelia to latch on to him quite like she has. 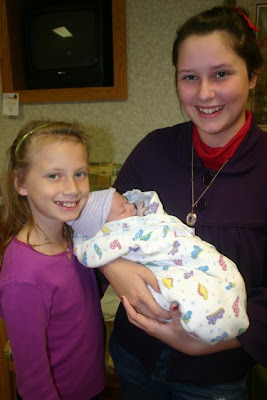 Yesterday, Madison was holding him and Amelia got progressively insistent about wanting to hold him. "Madison, I need to. I need to, Madison. I need to." When that didn't work, it was, "Madison, I've GOT to hold him. I've GOT to. I do!" At the hospital this morning, I had to ask about three times before she finally gave him up. "Amelia, can I hold him?" "You can in a minute." "Can I hold him NOW?" "In a minute." "Hey Amelia, I'm about to go. Can I hold Matthew?" "In a minute you can." So, clearly I am going to have to work on distracting Amelia or hope that the new wears off soon! Perhaps I have made this confession here before, but I actually drink a cup of coffee first thing in the morning. To make it more palatable I usually have some frou-frou flavor of Coffeemate, something my sweet coffee-loving husband wouldn't touch if his life depended on it but which I enjoy experimenting with. Pumpkin, Peppermint, Vanilla Caramel ... I've tried a bunch of them, but the newest flavor I've tried is Caramel Apple. And then it hit me: In a pinch, I've used DH's plain Coffeemate as a substitute for milk in tea before, and I'll bet this flavor would be good in some Apple Cider tea. 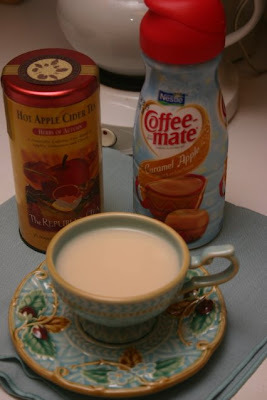 So, I made a cup and poured in a bit of the Caramel Apple Coffeemate. It really tasted good, like some Starbucks tea concoction, even. The bad news is, I for the first time read the ingredient panel on the Coffeemate, and it wasn't pretty. (You health-conscious readers knew that already, didn't you?) So I probably won't make a habit of adulterating my tea like this too often -- and the fact it's white tea is just wrong -- but it was certainly an interesting little experiment. To my great surprise, magazines about topics other than news and politics have been published within the last month. 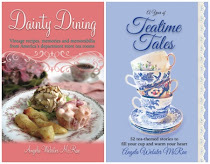 One of them, the cover of which is particularly lovely, is Tea Time. I have been pondering whether or not I'm wasting your time when I occasionally mention the Big Two tea magazines (this one and Tea A Magazine). But what if some of us *don't* get each issue? Wouldn't it be helpful to know which ones are the standouts? So you will see that at right, I have my first-ever poll up on the blog. (A poll! I'm going through election withdrawal!) But if you'd answer it, I'd be much obliged and know whether or not it's useful for me to blog about the tea magazines. 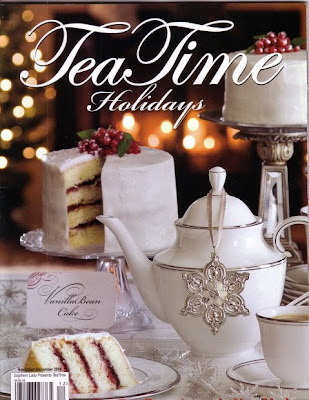 Although I have every issue of Tea Time and would probably buy it no matter what, some of the issues had started looking the same, and I thought I was seeing some recycled recipes. This one, though, features six recipes made with vanilla beans (including that elegant cake on the cover), a delightful menu in honor of Jane Austen, a Black Forest Trifle served up in cute individual glasses and more. It's really worth seeking out if you haven't already gotten it. 2. We have now elected our first African-American president. Born into white skin, I know I can't fully fathom what this means to blacks. I had lunch with a very liberal friend last week who is a few years older than I. She never expected to be able to vote for a black or a woman for president. I never questioned that I would be able to do both. That was a non-issue, to my way of thinking. I just expected our first black president to be a conservative! 3. Sasha and Malia get that puppy they've been waiting for! (And whatever political differences I have with their father, he certainly seems to be a wonderful family man.) It's going to be fun to see cute little kids in the White House again. 4. I must begrudgingly admit, Barack Obama was clearly the best candidate for a tea lover. It is well known that he has a fondness for green tea, which everyone knows is good for your health and, according to at least one researcher I heard last year, your smarts. I was a little concerned when, in "Dreams of My Father," he referred to the tea POT whistling and not the tea KETTLE, but then he's a man and may not be quite as aware of the distinction. So, thank you all for putting up with me on the political tangents this week. Congratulations to those of you whose candidate won. And as a Christian, I am also reminded it is my duty to pray for President-elect Obama, which I am doing. I pray for his blessing, his wisdom and his protection. And I'll end today with a great quote from Peter Robinson on National Review. He said, "We could've been born Saudis or Kenyans or Chinese ... but we got unbelievably lucky, unbelievably blessed. When you're born American, every day should be Thanksgiving. So on we go." Amen! Normally on Election Day, I make the newsroom's evening pan of lasagna that feeds the gang before everyone heads out to collect results of all the local races. This year, my colleague Brenda, knowing I am also on Baby Watch and feeling a little antsy about the day's plans, volunteered her husband to make the lasagna. So, that freed me up to make simply a pan of Seven-Layer Cookie Bars last night. 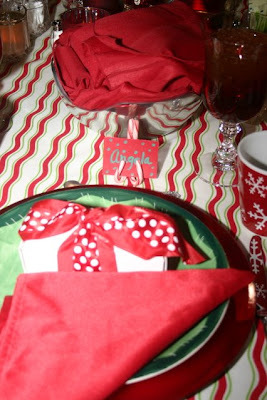 I also tried to spruce up a plain white cake pedestal to make things a little more festive, and I think the ribbon does the trick just fine. Amazingly enough, I still have some of the Eastern Shore Tea Company's Liberty Tea my friend Ashly brought me from the White House a few years ago. I'll drink a cup or two for good luck for my guy! And since I've early voted, and I don't have a summons to go see my new nephew, I'll be chained to the computer most of the day obsessing over every silly voting anecdote I can get my hands on. 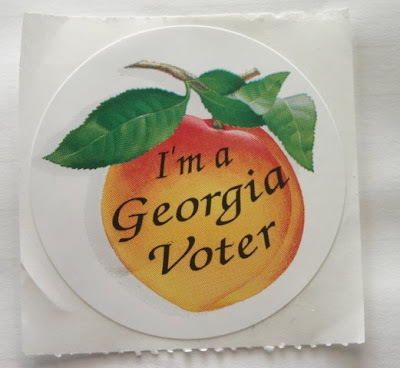 If those of you voting today care to leave a comment letting me know what you found at the polls (especially how long you waited in line), I would be more delighted than I can say! Have you voted yet? I have, and it was a bit of a concession for me because I've always preferred to vote on Election Day itself. I heard a man I was in line with on Saturday say that he gets no time off to vote, and if he hadn't voted Saturday, he wouldn't have gotten to vote at all. Mercy! But my excuse for early voting this year, my first experience with early voting, was this: My sister's baby boy is due Nov. 5, and I don't want to be stuck in line Tuesday if I get The Call. So I stood in line from 7:30-10:30 Saturday morning, making some headway in my latest library book, "The Forgotten Man," which is Amity Shlaes' highly-touted new history of the Great Depression. I didn't miss the irony of the fact I was reading about people standing in the soup line while I was standing among people in a voting line. Normally, though, I LOVE to be in line on Election Day, checking out the turnout, chatting with the pollworkers, and just generally enjoying the excitement of the day. In the newsroom where I work, you get brownie points if you come back with a really good story from the polls. I also have a history of making Election Day treats to share with my co-workers, so when I got my new issue of Hallmark Magazine in the mail, I was intrigued to see a recipe for something called Hartford Election Cake. Apparently, back in the days when people had to travel into town to vote, one of the treats served on Election Day was Election Cake. 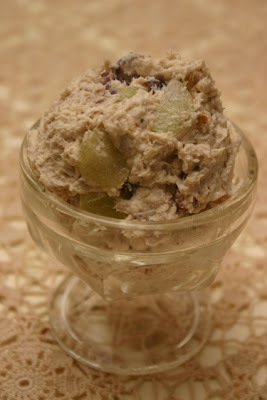 This particular recipe comes from Catharine Esther Beecher, the sister of Harriet Beecher Stowe. I'm happy to see that the recipe for Hartford Election Cake is right here, so you can make one yourself if you have the almost-five hours it takes to assemble the thing. 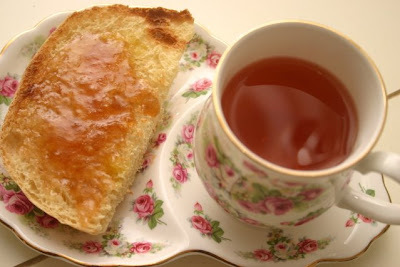 I enjoyed a nice hot cup of Lemon Chiffon Rooibos Tea with a slice at bedtime last night. I should probably mention that I substituted currants and dried apple for the raisins in the recipe, and I guess mine is also a Baptist cake since I used white grape juice instead of white wine. I had to bake it about 15 minutes longer 'til it was done, but that was fine. 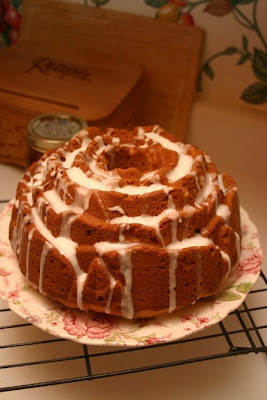 Oh, and I have only a rose-shaped Bundt pan, not a regular Bundt pan, so if I'd shot the photo from overhead you'd see I have a rose-shaped Election Cake. It wasn't hard to make, it just requires a good deal of patience since you have to let this yeast dough rise on several separate occasions. But hey, you've got a whole day before the election in case you want to make one yourself for the political junkies in your life. So happy voting, happy baking and may God Bless America!